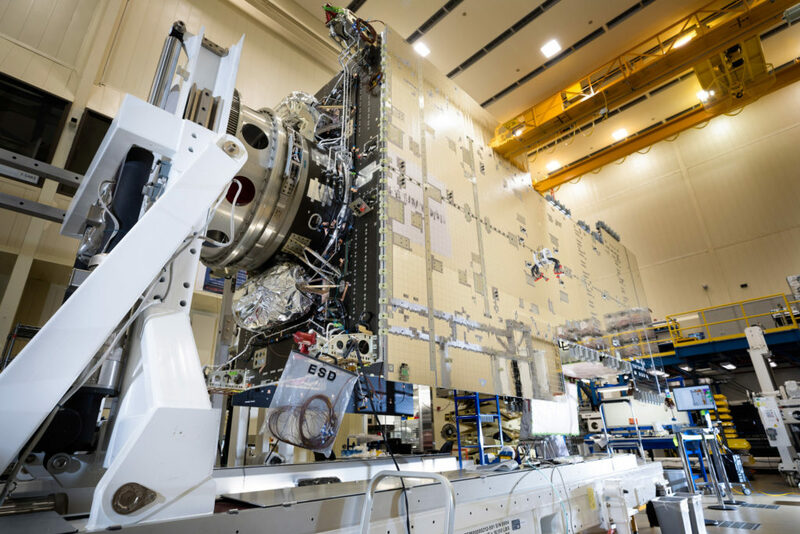 August 14, 2017 – A team of engineers and technicians at Lockheed Martin has completed the integration of the company’s first modernized A2100 satellite. The spacecraft, known as Hellas-Sat-4/SaudiGeoSat-1, now moves into final assembly and testing, on track for launch in the second quarter of 2018. Built for Arabsat and King Abdulaziz City for Science and Technology, Saudi Arabia, the satellite will provide advanced telecommunications capabilities, including television, internet, telephone and secure mode communications, to customers in the Middle East, Africa and Europe. This milestone on a modernized A2100 satellite sees the hybrid propulsion integrated with the payload module and transponder panels. Using a combination of electrical Hall current thrusters and liquid apogee engine, the propulsion subsystem serves as the structural backbone of the satellite and is essential for maneuvering it into its final orbit as well as keeping it on station throughout its mission. The modernized A2100 builds on a flight-proven bus that is the foundation for more than 40 satellites in orbit today. Through an internally-funded, multi-year modernization effort, Lockheed Martin has enhanced the spacecraft’s power, propulsion and electronics, while also adopting the latest advanced engineering and manufacturing techniques to decrease production costs and timelines. There are five modernized A2100 satellites currently under contract to Lockheed Martin. They are designed for a host of missions and customers around the globe.